Your post is the second one I saw with this same commentary. It made me sad but didn’t necessarily offend me– that is a fine line but a big difference on how I’m going react/respond moving forward. Thank you for offering to exchange views with me so I could put this to the light of Christ to discern how best to view this– it is certain to be viral in no time. I saw it coming because many proclaimed Christians are not motivated by or demonstrating love. 1 Corinthians 13 is the go-to verse for love… It is patient and kind; never haughty or boastful. 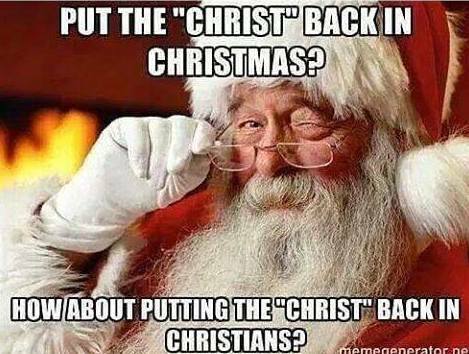 The anger shown with the Happy Holiday debate in the past and now the push for icons that have pagen roots, truly doesn’t represent the Christ we are called to emulate. I heard a truthful teaching from a respected teacher of the Word named John MacArthur. His radio broadcast was on right after I read your reply about politicians [her point is that many politician claim to be Christian but do not act out their beliefs]. John’s message today was exactly on target. There are many false teachers and hypocrites walking among us. The most deceptive are likely standing in pulpits and sitting in pews. This is why it is imperative to be knowledgable about the Word to discern truth from deception. The scripture that came to mind when I read your comment is in Matthew 7 where Jesus is teaching that the gate is narrow and few will be able to enter heaven. They will be surprised to hear Him say, “I did not know you” when they meet their proclaimed savior. This is why I first responded that this new viral message makes me sad… it is true. By pondering this for a few hours, I have to decide to not be offended when I see it. I am certain to see it many times over the coming weeks. The problem I have is that it can be hurtful– like any other generalization of stereotype of race, nationality, or gender. However, from John MacArthur’s teaching today, I also learned the God I am following does offer grace more than we deserve; He also disciplines as a Father should. If I take offense to this statement, surely it is because I lack discipline and therefore, I likely am guilty of the very statement it makes. In fact, I should be encouraging my sisters and brothers who share my faith toward a closer relationship with their Savior. However, I need to do so with love… the same love of 1 Corinthians 13. The sting of this message will continue to burn when it is put forward by folks who deny Jesus as their savior… this too is why I’m sad. Rightly so, the stereotype is earned because we all fall short of grace. Westbourough… Branch Davidians… Scribes and Pharisees… there have been some bad among the good since the beginning of mankind. There are examples of backsliders in both the old and new testaments and this is why God gave us this one book to reference. No politician will please everyone because they will never be perfect– only one man walked the earth with perfection and many refuse to acknowledge His existence. I wish I could align with political leaders or one party and call it a day. I wish too, they wore their financial sponsors on their sleeves like Nascar drivers. My president will never be my Lord; she or he will only be the leader. That job is increasingly becoming impossible due to the lack of respect we hold for any authority. It seems to be an ebb and flow between two political parties eroding the shoreline of reason– the tides are moving with such force in either direction that we may never find a balance of logic for the majority of mankind. I’ve typed far too much and I appreciate the freedom to do so but hope it doesn’t come at the price of friendship. I don’t think it will because I believe I know your heart. My concern is that many will read this soon to be viral post and it will fuel a raging fire rather than ignite passion in a true Christian’s soul to disprove the stereotype. No matter what conflict erupts, I can’t say I wasn’t warned. It was prophesied as well.